Coll. No. 1257, 26 Jul 2015, characters observed: Annual (?) to 45 cm. ; Leaves, cauline, alternate, 40 mm. × 4 mm. 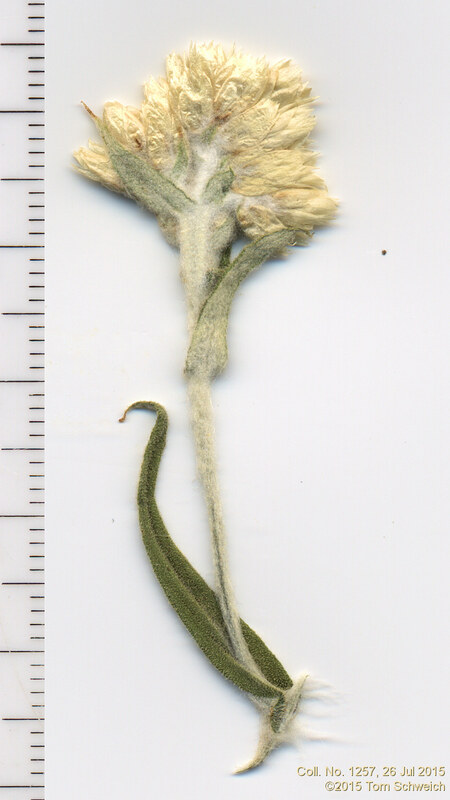 wide, decurrent, lance-linear, entire, stalked glandular, tomentose abaxially; Inflorescence, branched axial and terminal; Heads in tight clusters, disciform; Involucre, 4 mm. ; Receptacle, epaleate; Phyllaries in 4+ series, hyaline; Pappus, bristles. Field Notes: Coll. No. 1257, 26 Jul 2015. Other photos about Species - Asteraceae or Pseudognaphalium macounii.